Get your free personal quit plan! If you are a smoker then stopping smoking is the single best thing you can do for your health. Of the 6.1 million smokers in England, six in 10 want to quit but many try to quit using willpower alone – or go ‘cold turkey’ – despite this being the least effective method available. 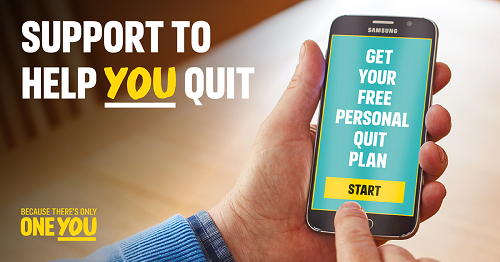 If you smoke you can now try our FREE ‘Personal Quit Plan’ which helps you find the right support for you to quit in just three easy steps, taking into account how much you smoke, and any quitting support you may have used previously. An experiment was recently conducted to demonstrate the high levels of carcinogenic chemicals and tar inhaled by an average smoker over a month compared to someone not smoking or using an e-cigarette. The experiment reveals the stark comparison between smoking and vaping and visually illustrates research which estimates that e-cigarettes – while not risk-free – are at least 95% less harmful than smoking. See the shocking results of the experiment described above for yourself and find out what support is available to you through the Personal Quit Plan on our smoking health harms page. « Try our FREE How Are You quiz!